Tucked away all the way “down south”—not just in the Southern Hemisphere but in the south of the South Island of New Zealand—Dunedin may not be the easiest-to-reach place on the planet, but is well worth the travelling effort! Recently named a UNESCO City of Literature, Dunedin is a university city that is small enough to be explored on foot (well, mostly …), yet offers plenty of urban delights. With its 120,000 inhabitants, Dunedin is temporary home to more than 20,000 students, and counts among its permanent residents many writers, artists, musicians, fashion designers etc. The “Dunedin Sound” is the stuff of legend; more recently, Dunedin has not just made a name for itself as a fashion destination of note (as host of the annual iD Fashion Week), but has offered its bland warehouse walls as blank canvases to visiting street artists from around the world, giving rise to the colourful and imaginative Dunedin Street Art Trail. In addition to its many artistic offerings, Dunedin features stunning beaches and is home to both the Royal Albatross colony and the Little Blue Penguin colony—as well as of course being the gateway to some of New Zealand’s most beautiful landscapes. In fact, if you’re travelling to Dunedin from overseas, you may well want to extend your stay and use the opportunity to explore Fiordland National Park and its spectacular scenery (Rudyard Kipling named Milord Sound the “Eighth Wonder of the World”) via one of the region’s Great Walks. Or hire a car and head into Central Otago: with Queenstown remaining New Zealand’s undisputed adventure capital, the larger region offers some of New Zealand’s best (and most scenic) wineries. Another favourite haunt just a short walk from the University (esp. good for vegetarian options). Restaurant and bar close to the University that offers local cuisine and a good selection of craft beers. Dunedin’s only dedicated vegan restaurant: inexpensive and tasty. Great vegan food can also be found at The Joyful Vegan: a popular stall at the Otago Farmers Market (run on Saturday mornings near the historic Railway Station). Located just off the Octagon on Lower Stuart Street, Bacchus is on the pricey side but well worth it: food, service and ambience are divine. Moderately expensive but delicious Scottish cuisine. Upstairs is the Doon Bar which has snacks and nice whiskeys. The address is somewhat misleading … as the website says, you probably won’t find this place unless you’re looking for it! Described as a “lounge bar,” this little place is down an alleyway off Moray Place (opposite the Rialto Cinema) and has a good selection of cocktails and drinks. Very chill vibe and friendly staff. A local favourite. So popular it’s now feautured in the Lonely Planet. Great Whiskey and usually crowded. But worth it. Dunedin’s newest destination café in the heart of the Warehouse Precinct. Beautifully restored building & good ethical food: love it! Located on the Harbour near Queens Gardens, Toitu is a recently redesigned museum show-casing Otago’s settler history via exhibitions. It also houses a nice café and gift shop. It is approximately 20mins walk from the University and is close to the Octagon. Located next to the Octagon, the DPAG has a range of contemporary exhibits, a fab gift shop and one of the few all-day and weekend cafés: Nova. Located just opposite the University on Great King Street, the Museum features contemporary and historical exhibits and has a nice café. Located on Otago Peninsula at Taiaroa Head, the The Royal Albatross Centre runs tours of the Albatros colony. The site is also home to penguins and seals so if you can mission out there it’s well worth your while. If you hire a care, it’s a 45min drive from the centre of Dunedin. Alternatively, you can book a half-day tour through Monarch Wildlife Cruises and Tours for $89. There are many fine beaches around Dunedin but the easiest one to get to is St Clair Beach, located about 15mins drive from the centre of Dunedin. There is a salt water pool on site and great restaurants lining the beach. It’s also accessible by public bus (28 or 9 from the Octagon). Just a couple of kilometers south of St Clair, off the Dunedin to Brighton costal road, this is one of Dunedin’s most iconic locations. A short (but steep) walk from the car park, Tunnel Beach is a beautiful small beach that is reached through a narrow rock tunnel that was hand-carved in the 1870s. Allow one hour return for the track (best acessed at low tide). New Zealand’s only castle, located on the Otago Peninsula. It has a great view of the city and the surrounding gardens are lovely. There’s also a good restaurant/ café located on site. The Castle is around 20mins drive from the centre of Dunedin. 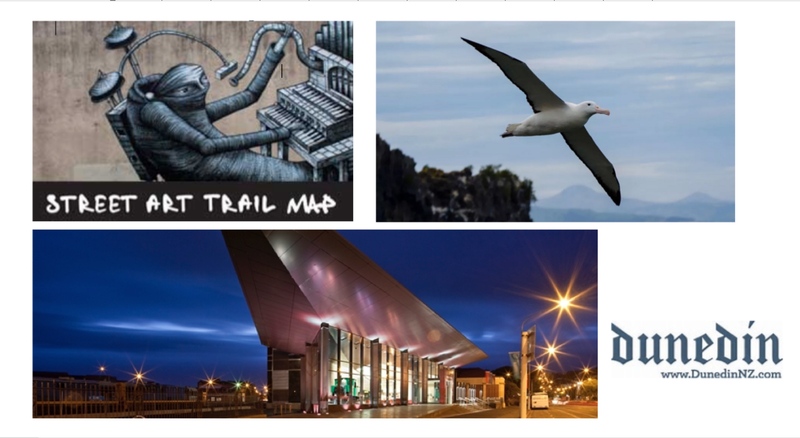 For more information on the above venues and sites, and for other adventures, please visit the Dunedin Visitor Centre.